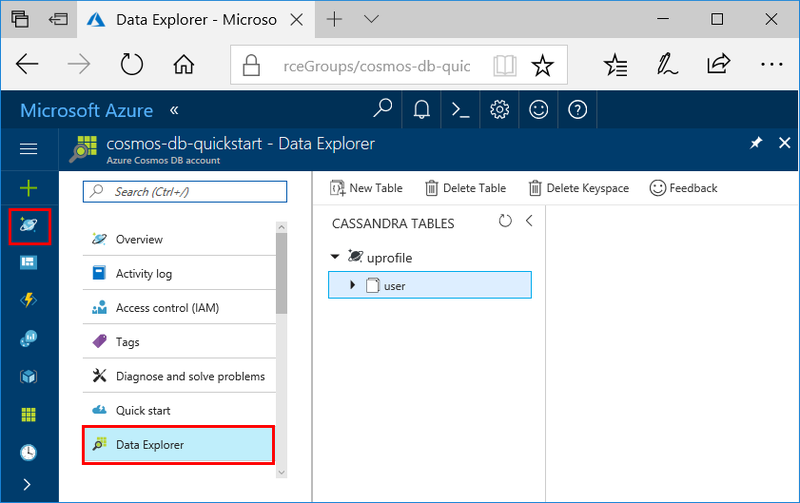 This quickstart shows how to use .NET and the Azure Cosmos DB Cassandra API to build a profile app by cloning an example from GitHub. 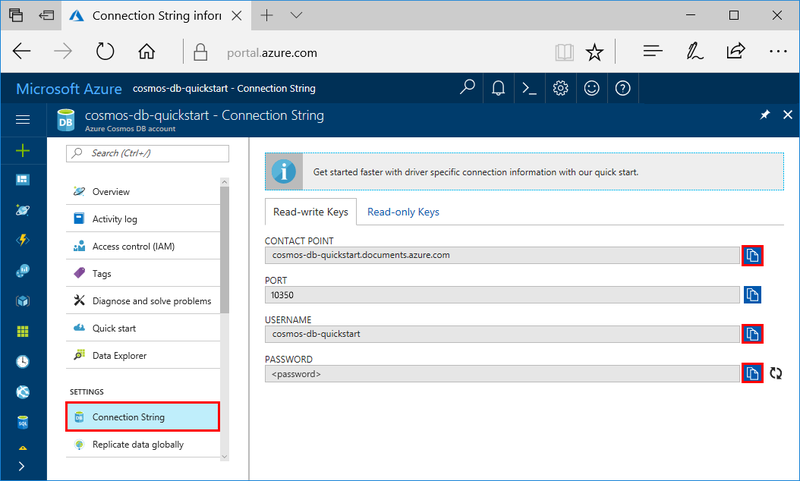 This quickstart also shows you how to use the web-based Azure portal to create an Azure Cosmos DB account. Azure Cosmos DB is Microsoft's globally distributed multi-model database service. You can quickly create and query document, table, key-value, and graph databases, all of which benefit from the global distribution and horizontal scale capabilities at the core of Azure Cosmos DB. If you don't have an Azure subscription, create a free account before you begin. 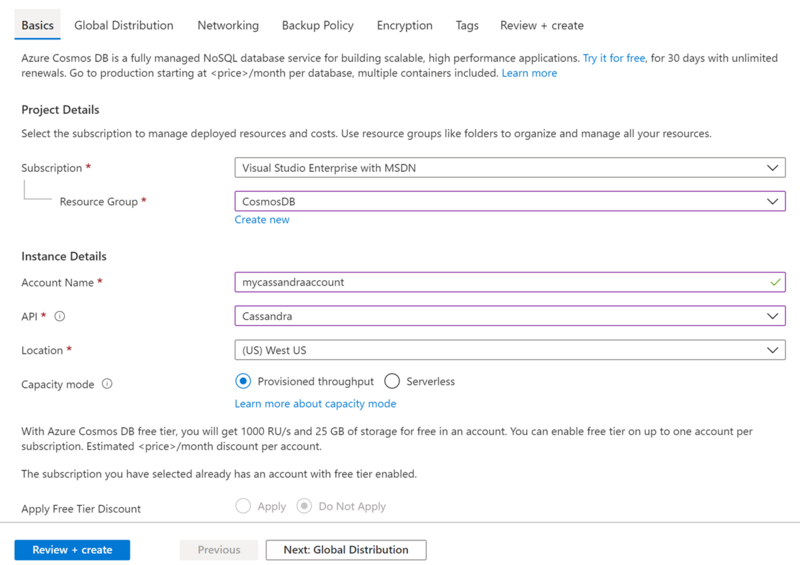 Alternatively, you can Try Azure Cosmos DB for free without an Azure subscription, free of charge and commitments. Install Git to clone the example. API Cassandra The API determines the type of account to create. Azure Cosmos DB provides five APIs: Core(SQL) for document databases, Gremlin for graph databases, MongoDB for document databases, Azure Table, and Cassandra. Currently, you must create a separate account for each API. Select Cassandra because in this quickstart you are creating a table that works with the Cassandra API. Learn more about the Cassandra API. The account creation takes a few minutes. Wait for the portal to display the page saying Congratulations! Your Azure Cosmos DB account was created. Now let's switch to working with code. Let's clone a Cassandra API app from GitHub, set the connection string, and run it. You'll see how easy it is to work with data programmatically. Open a command prompt. Create a new folder named git-samples. Then, close the command prompt. Next, open the CassandraQuickStartSample solution file in Visual Studio. This step is optional. If you're interested to learn how the code creates the database resources, you can review the following snippets. The snippets are all taken from the Program.cs file installed in the C:\git-samples\azure-cosmos-db-cassandra-dotnet-getting-started\CassandraQuickStartSample folder. Otherwise, you can skip ahead to Update your connection string. Initialize the session by connecting to a Cassandra cluster endpoint. The Cassandra API on Azure Cosmos DB supports only TLSv1.2. 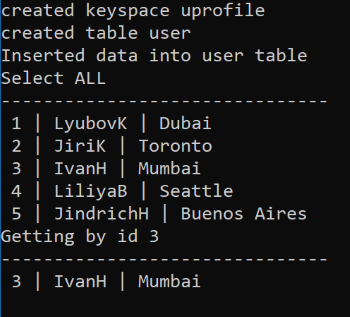 Insert user entities by using the IMapper object with a new session that connects to the uprofile keyspace. Query to get all user's information. Query to get a single user's information. Now go back to the Azure portal to get your connection string information and copy it into the app. The connection string information enables your app to communicate with your hosted database. In the Azure portal, select Connection String. Use the button on the right side of the screen to copy the USERNAME value. In Visual Studio 2017, open the Program.cs file. Paste the USERNAME value from the portal over <FILLME> on line 13. Go back to portal and copy the PASSWORD value. Paste the PASSWORD value from the portal over <FILLME> on line 14. Go back to portal and copy the CONTACT POINT value. Paste the CONTACT POINT value from the portal over <FILLME> on line 15. In Visual Studio, select Tools > NuGet Package Manager > Package Manager Console. At the command prompt, use the following command to install the .NET Driver's NuGet package. Press CTRL + F5 to run the application. Your app displays in your console window. Press CTRL + C to stop execution of the program and close the console window. In the Azure portal, open Data Explorer to query, modify, and work with this new data. 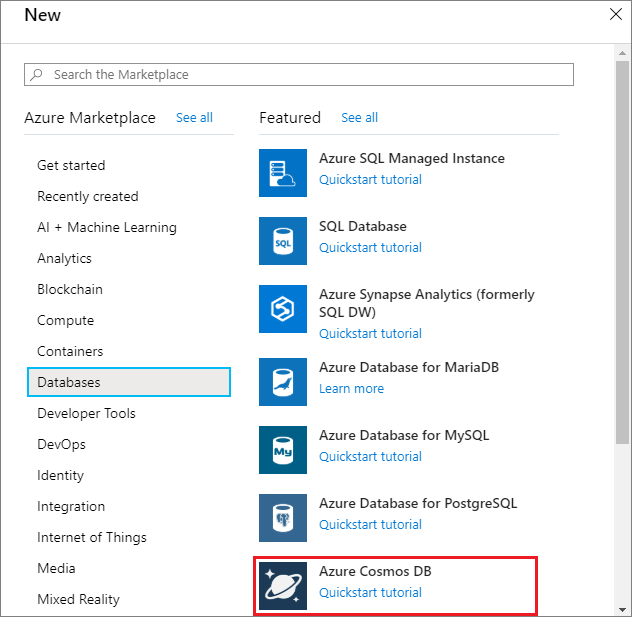 In this quickstart, you've learned how to create an Azure Cosmos DB account, create a container using the Data Explorer, and run a web app. You can now import additional data to your Cosmos DB account.